Tip: Don’t be afraid to get creative as you get used to making this recipe. You can easily add new and exciting toppings to create stunning flavours. Veganism is on the rise and there’s lots of trendy Vegan restaurants popping up that are cooking wonderful tasty dishes. We were recently at the Casual Dining Expo in London and most of the exhibitors were offering vegan products, including ourselves with our Vegan Filled Pasta! 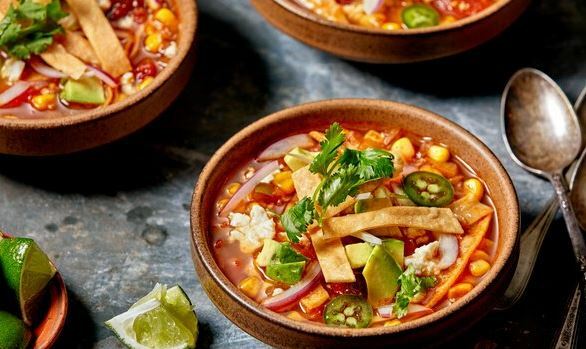 So, we thought this month we’d have our chefs create a Vegan recipe that you can easily try at home….. A delicious meal for the start of the summer – A Healthy, Hearty Vegan Tortilla Soup. This is a simple and easy to prepare meal that you can include as part of your weekly dinner options. It’s extremely healthy, well balanced and something all the family can enjoy. For little ones you can blend the soup to your desired consistency. Why not make it a team effort and get your kids involved in helping to prepare this recipe because it’s a lot of fun to make!! In a large heavy based pot, heat the olive oil on high for 1 minute. Add the cumin & coriander seeds and fry until they start to pop, 2-3mins. Add the onions, garlic, pepper & chipotles, sweat for 5 minutes before adding the tomato paste and cooking for another 2-3 mins. Add the chopped tomatoes, vegetable stock and season, bring to the boil before adding the sweetcorn and black turtle beans. Turn down to a simmer and allow to cook for 20-30mins. Meanwhile, whisk together the sugar, vinegar & chilli flakes until the sugar is dissolved. Add the onions, wrap with cling film and allow to sit in the fridge for 30mins. Ladle into large, preheated bowls. Garnish with the pickled red onions, coriander leaves, avocado, chilli flakes, scallions & tortilla chips and enjoy!! Well whether you’re a budding vegan or a curious meat eater looking for something a little different this recipe is definitely worth a shot! If there’s anything you would like our chefs to create for you we’d love to hear from you. Send us a quick message with your idea and we’ll get them to look into it for you.